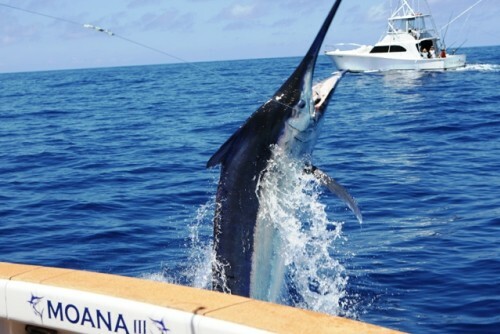 Sportsfishing Experience on the Great Barrier Reef, Deep Sea Fishing and Light tackle Sportsfishing targetting juvenile Black Marlin, Sailfish, Spanish Mackerel, Giant Trevally, Dog Tooth Tuna, Wahoo, Yellow and Blue Fin Tuna, Cobia, Mahi Mahi and many more. These fish are all found in the waters on the edge of the Great Barrier Reef, just an hour out from Cairns. With Reef Fishing we target amongst others Red Emperor, Coral Trout, Nannygai and Job-fish. 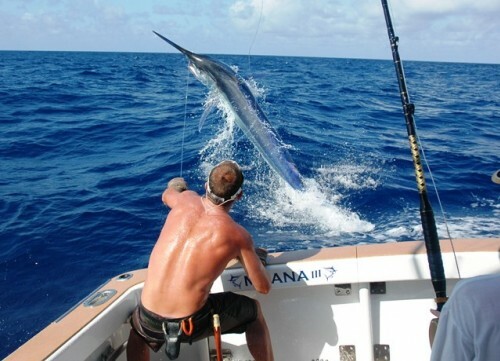 The Juvenile Black Marlin, are also found less than one hour from Cairns, in the size range from 30lbs to 120lbs. 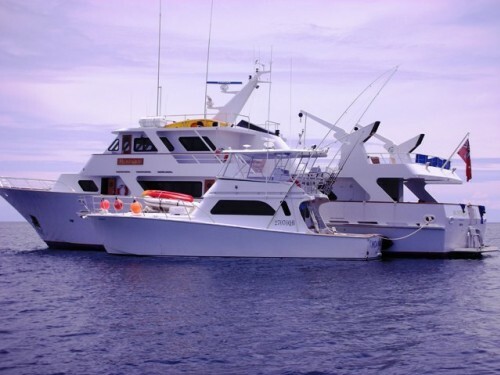 These charters are available all year round. The best season however is March to September and from December to January. We also specialise in adventure fishing charters to remote areas of Princess Charlotte Bay, Cape York Peninsula, Gulf of Carpentaria and Papua New Guinea. These trips are tailored to suit your own interests, skills or fishing experience. 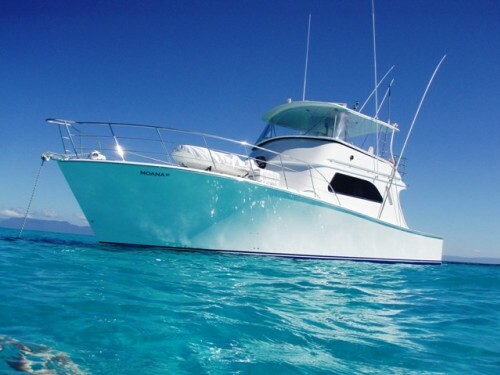 The boat can also be used for Family & Friends, Business Networking, Corporate Functions, Honeymoon Getaways, Luxury Day Cruising, Whale Watching. Maximum Passengers: 4 on Moana III, the number on the mothership varies on the ship often 4 or so. Departure Time: around 8am but up to you. Departure Point: Cairns Marina, however we can also do trips (depending on the length) from Port Douglas, Cooktown and Lizard Island. Relocation fees apply. Inclusions: All fishing gear, tackle and bait, snorkelling gear, all meals, water, light refreshments. Extended Trips – linen, basic beer and wine and a complimentary T-shirt. Exlcusions: Practical clothing including a good sun hat, sunscreen, cameras and accessories. MOANA III vessel and MOANA Charters, are owned by Maxwell and Lorraine Stewart and operated by Captain Daniel McCarthy. Moana III is 47 ft Luxury Private Charter Boat. The team are all Cairns locals who are addicted to fishing. Daniel is Qualified as a Master Class IV Captain and MED II (engineering) he has been skippering since the age of 21, thats over 18 years ago! He has extensive knowledge of the fishing waters around Cairns, Cape York, the Coral Sea, the Gulf of Carpentaria and New Guinea. He is also president of Cairns Professional Game Fishing Association, so is committed to conservation of a clean ocean environment and leads the world in Tag and Release Game Fishing. Moana III (“the vast beauty of the ocean” in Polynesian) was launched late in 2006 to specialise in Game Fishing, Marlin Fishing, Light Tackle Sportsfishing, Reef and Deep Sea Fishing. At 47ft she is Queensland 2B surveyed for operations to 200 NM from the coastline. She is surveyed to comfortably carry up to 12 passengers for day trips, with 6 for overnight trips and 4 for extended trips. She is Fully air conditioned has a Private stateroom with TV/DVD and ensuite 4 single bunks, 1 extra double and 2 crew bunks. She has a modern fit out with 2 showers, 2 toilets, TV, DVD and CD Stereo, 240V Power, Convection Microwave Oven Cooktop 2 Refrigerators and 3 freezers and a Desalinator. She can cruise at 25kts, max speed 32 kts and is powered by twin Cummins QSM-11s @ 660 hp each set at 580 hp. We have a full set of fully custom built world class Laurie Casey Rods and Penn International and Shimano Reels ,Furuno 1100L Depth Sounder/Fish finder with twin 2kw transducers (50and 200kHz) ,Furuno Nav Net VX2 Chart Plotter with radar, Wesmar scanning Sonar, ICOM HF and VHF radios, Intercom system 9ft ridged hull inflatable tender.